An edited version of the following piece appeared in today’s Taipei Times. 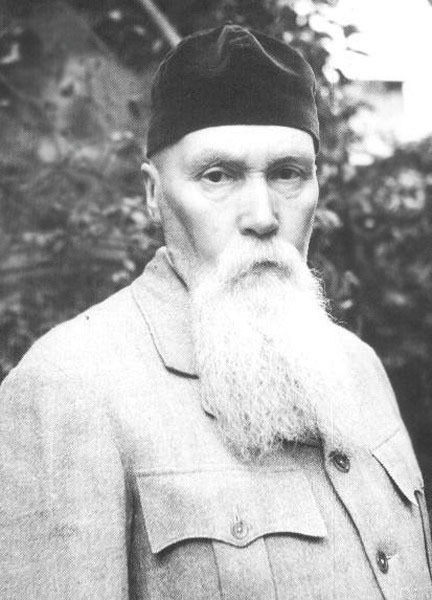 Nicholas Roerich in India, sometime between 1940-47. He was to spend most of the last 15 or so years of his life there. Aside from some low-key events in Europe and Latin America, yesterday’s Universal Day of Culture passed in the same way as previous installments: unremarked. Despite the lack of fanfare, the mind behind this occasion played a role in protecting of some of the world’s most valuable artifacts, including the treasures at Taiwan’s National Palace Museum. Established on April 15, 1935 to coincide with the signing of the Roerich Pact, an agreement on the primacy of cultural objects during wartime, the Universal Day of Culture is dedicated to “the full appreciation of all national and universal treasures of culture.” The culmination of decades devoted to defending the arts by the Russian painter and mystic Nicholas Roerich, the pact and the day marking it laid the foundations for UNESCO protocols on cultural property . Part of Roerich’s concept design for Diaghilev’s 1913 production of Stravinksy’s Le Sacre du Printemps (The Rite of Spring). Despite the near riot and scathing criticism that met the opening night in Paris, the set and costume design received wide acclaim. As early as 1903, Roerich had penned reflections on the sorry state of Russia’s architectural heritage. His paintings of historical sites during travels that year provide the only visual evidence of some of the lost buildings from those locations. 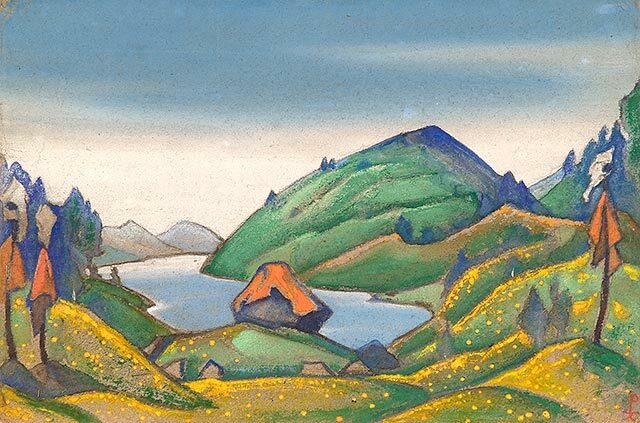 The following year Roerich formalized his views in a report to Russia’s architectural society, headed by Tsar Nicholas II. 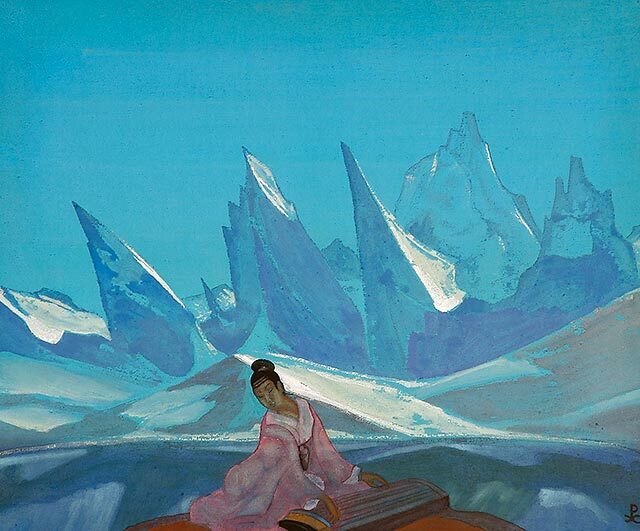 Having achieved international renown for the set and costume designs of Stravinsky’s controversial 1913 ballet The Rite of Spring in 1913, Roerich brought his burgeoning heft to the political sphere with the outbreak of WWI. He lobbied the Russian military and the Allies on the dangers posed to art and architecture and, in 1915, provided the Tsar with another report on the need for action. Subsequently petitioning governments worldwide on the establishment of laws to safeguard cultural heritage, Roerich cultivated relationships with leaders such as India’s Jawaharlal Nehru and US Vice President Henry Wallace. However, much less well-documented is his meeting and subsequent correspondence with Chiang Kai-shek. Interaction between the pair was fleeting but evidence suggests Roerich helped save the tens of thousands of objects that followed the Nationalists in their relocations around China and, ultimately, to Taipei. Kuan-Yin (1933), Nicholas Roerich Museum. Defying facile pigeonholing, Roerich was foremost a spiritualist drawn to Eastern religions and alternative belief systems such as theosophy, under the influence of his wife Helena. He had a vision for world peace, which began with the creation of a spiritual union between Asia and Russia – a kind of Buddho-Communist utopia. To this end, in 1923, he embarked on a long and arduous expedition to Inner Asia. Remarkably, given the contemporaneous Communist repression of artists and intelligentsia, the trip received state sanction. This was perhaps partly due to Roerich’s offer to spy on the British in India and his suggestion that any future commonwealth would exist under Soviet guidance. All things to all men, Roerich meanwhile cast the trip as an artistic endeavour in international media. 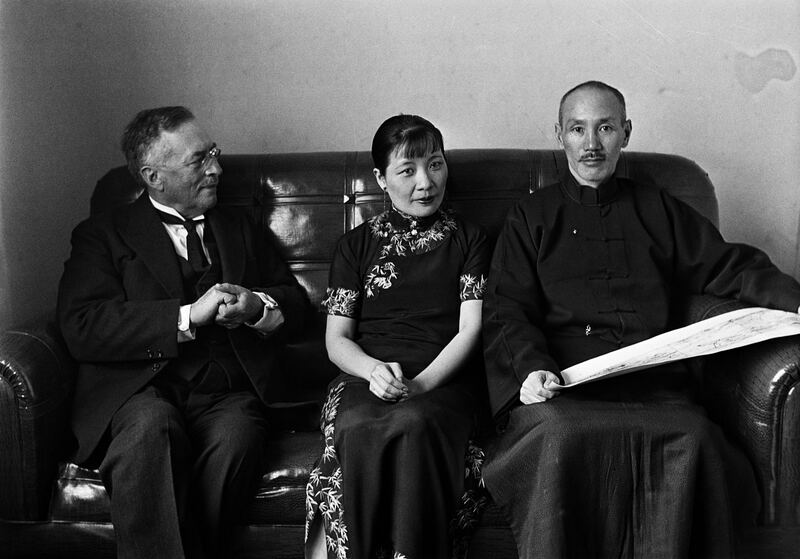 Sven Hedin discusses his expedition to Xinjiang with Soong Mei-ling and Chiang Kai-shek in Hankou, 1935. Still, Roerich continued to correspond with Chiang, receiving a written promise from the Generalissimo to abide by the provisions of the artist’s nascent pact. With the Sino-Japanese War breaking out soon after, Chiang moved more than 15,000 crates of objects from the Palace Museum in Beijing to locations in Sichuan and Guizhou before finally ferrying them to Taiwan in three main shipments between December 1948 and February 1949. Of course, a cynical view might hold that rapacity, hardly in short supply among the Nationalists, rather than patriotic duty, was behind the desperate concern for this priceless bounty. “Fortune was with us; not so much as a teacup was broken,” the National Palace Museum’s first director Han Lih-wu (杭立武) told the New York Times in 1986. By most accounts this is true. What remains unknown is the level of shrinkage that occurred en route. For all his monumental character failings, though, Chiang did care about China’s cultural heritage. But, as Andreyev notes, the Generalissimo had his hands full. Persistent nudging by the likes of Roerich surely played a part in ensuring the safety of the treasures. 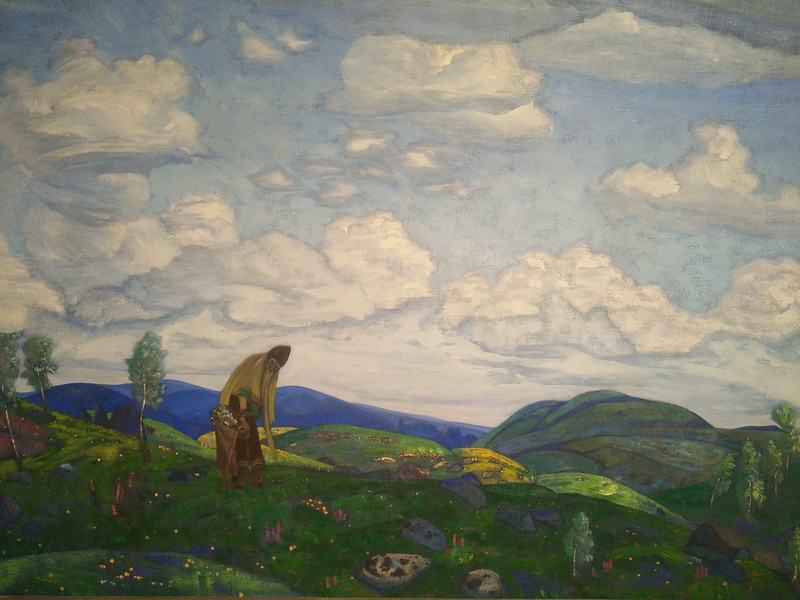 St. Panteleimon the Healer (1916) by Nicholas Roerich at Moscow’s State Tretyakov Gallery (my photo). Obsessed with ancient culture, as well as his transcendental role in its preservation, Roerich was earnest and tireless in his endeavors. For a brief moment in war-torn China, his interests coincided with those of its failing leader. For Sinophiles, art lovers or indeed anyone concerned with cultural heritage, this meeting of minds was a blessing. * One of my purposes in visiting the State Tretyakov Gallery last summer was to see Ilya Repin’s Ivan the Terrible and His Son Ivan (1885). Intrigued as he always is by tales of political plots and murder, my younger son had shown an interest in seeing this masterpiece. When we finally got to the Repin room, we found a signboard with a small print of the painting and some words explaining that the painting was being restored. A member of staff explained that it had been vandalised – the second time this had happened. The first occasion was in 1913 by an alleged religious fanatic, though Repin himself believed it to be an attack against the “classical” elements of his work by the Modernist/Futurist thought. The curator at the time – a minor landscape painter named Georgy Khruslov – was said to be so distraught that he committed suicide. The painting has remained controversial over the years and, though apparently pissed up when he went at it with a metal pole (quite how he sneaked that in is anyone’s guess), the culprit behind the most recent attack reportedly cited nationalistic motives. 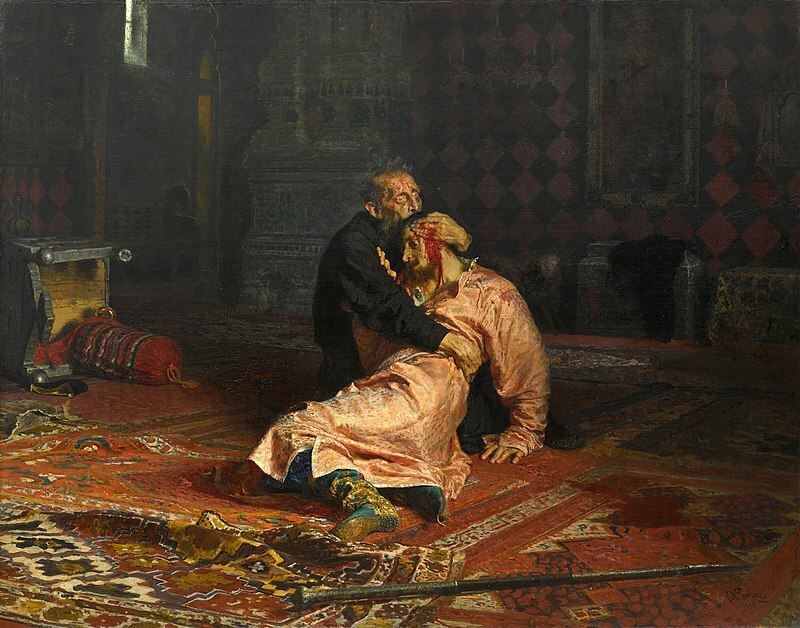 The work remains absent from the current Repin exhibition, which is showcasing more than 300 works by the great artist. Making the most of these senseless acts, the gallery has introduced an interactive display detailing the attacks and the restoration work. In January, another work by the landscape painter Arkhip Kuindzhi was stolen from the Tretyakov, with the thief apparently just pulling it off the pall in front of other museumgoers and walking out with it under his arm. It was quickly recovered, but coming so soon after the vandalism (and another incident which saw a “performance artist” strolling around the museum in a G-string) this latest incident has led to what seems like a long overdue overhaul of security measures at the Tretyakov. Given Roerich’s lifelong efforts to protect artworks and the fact that some of his paintings hang in rooms on the floor below the Repin room at the Tretyakov, these incidents were in my head as I researched this piece. Despite the disappointment at the missing masterpiece, we did enjoy the Tretyakov. While Son No.1 slept most of the day away at the hostel across town, Felix and I spent more than two hours at the gallery taking in some of the greatest works in the history of Russian art. To be honest, I could have easily spent twice as long but the lad understandably began to flag towards the end. “I’m not bored,” he insisted. “But my legs are getting tired.” He liked Serov, a painting called At Breakfast by Zinaida Serebriakova and another with a dog at a family table that we’ve been unable to track down. In general those works featuring children and animals proved popular. 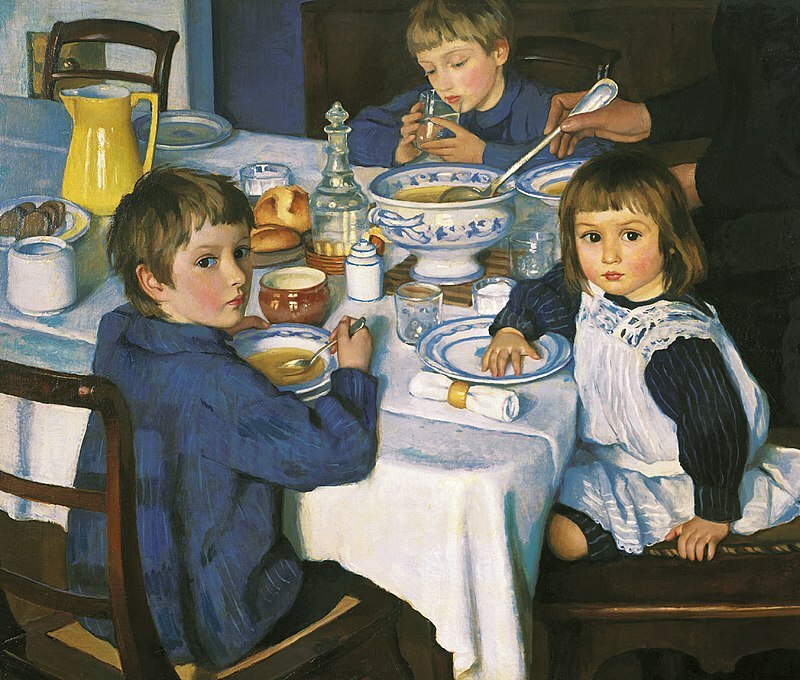 At Breakfast (1914) by Zinaida Serebryakova, also at the Tretyakov.